Inverawe Smokehouse began with just one smokebox. Today we are proud to be one of the biggest mail order companies and one of the most renowned smokehouses in Scotland and holders of the Royal Warrant. Our smokehouse products are famous for their gorgeous smoky, full-bodied flavour. Our traditional way of wood smoking flies in the face of modern production because we rely on real people taking their time and using age-old skills rather than cutting corners with rows of machines. But we think you'll agree when you taste our hot smoked salmon, or any of our many other smoked foods, that the end result is worth the wait. Although this way is more time consuming and labour intensive, the end result surpasses all expectations. The preparation is as important as the smoking process. At this stage you can add herbs and different seasonings to enhance the product - hence the many secret recipes passed down through the generations. At Inverawe Smokehouses we have our closely-guarded recipes but our real secret is our insistence on only using the finest fish. A smoked fish is only as good as the one you start with. In the old style brick smokeboxes the fires are kept going 24 hours a day, we burn British Oak from our FSC certified supplier, releasing warm smoky air which gradually dries the fish. As it does so, the smoke naturally preserves the fish. The food will acquire its faintly 'fruity' flavour, so difficult to describe but instantly recognised by its taste. Genuinely cured food has it, while so much of the merely smoke-flavoured food has not. The whole smoking process can take anything from 24 to 72 hours. Each smokebox 'smokes' slightly differently and it is Patrick and his team's craftsmanship and experience which determines when it is ready. Outside influences - wind, temperature, rain, sunshine - all have to be taken into account. The cold smokebox is partitioned off from the fire with a vent controlling the smoke intake. 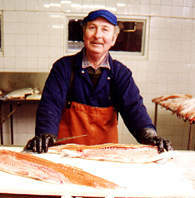 It is mainly for salmon and trout fillets. The temperature never goes above 30C and the fish is gently smoked for 24 to 72 hours. The hot smokebox is immediately above the fire. Being closer to the heat of the fires it smokes and cooks the fish, giving an all new flavour and melt in the mouth texture. Our award-winning Flaky Roast Smoked Salmon is a must. 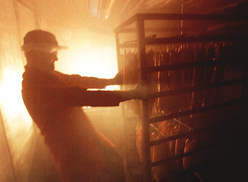 The products are usually cold-smoked overnight and then hot-smoked in the morning, when the fire lid is taken off and the product is cooked.